More worrying than the tower itself, however, is what’s around it. In 1956, Frank Lloyd Wright unveiled a scheme for an elegantly preposterous mile-high skyscraper for Chicago, safe in the knowledge that he’d never have to figure out how to build it. 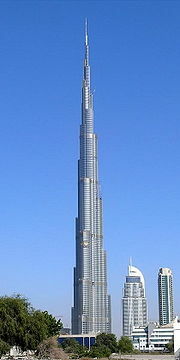 It was undoubtedly an influence on the Burj Dubai. It even had a similar triangular structure. But Wright’s intentions with his mile-high skyscraper were to create a concentrated human habitat, the better to halt Chicago’s unstoppable urban sprawl, and free up ground space for parks, nature and leisure. The Burj Dubai, by contrast, has become the tentpole for several more acres of anonymous, soulless, energy-hungry cityscape. You can apparently see for 60 miles from the top, but when you look down, the immediate landscape is the same schematic real-estate tat you see everywhere else in Dubai: vast shopping malls, bland office towers, sprawling residential developments semi-themed to resemble “traditional” Arabian villages, outsized ornamental fountains. The Burj Dubai might be a triumph vertically, but what about the horizontal? To be sure, the world’s record-breaking skyscrapers, such as Burj Khalifa, often presage recession, but with time these buildings have gone on to form the centrepiece of thriving economic centres, such as the Empire State Building in Manhattan. When Dubai built what was then the region’s tallest tower in 1979, it was ridiculed for building the World Trade Centre on the sand-strewn outskirts of a city. Now the World Trade Centre sits in the middle of a developed area and Dubai has transformed itself from a trading post to a commercial centre. The emirate is once again banking that a bet on infrastructure, now complemented by the world’s tallest tower at the new heart of the enlarged city, will allow it to retain its position as the services hub for the region. It will likely take many years to work through the excesses of the past decade, but it would take a brave man to bet against the city in the long term. The city-state is also a miniature Raj in a more important and notorious aspect. The great mass of the population are South Asian contract labourers, legally bound to a single employer and subject to totalitarian social controls. Dubai’s luxury lifestyles are attended by vast numbers of Filipina, Sri Lankan and Indian maids, while the building boom (which employs fully one-quarter of the workforce) is carried on the shoulders of an army of poorly paid Pakistanis and Indians, the largest contingent from Kerala, working twelve-hour shifts, six and a half days a week, in the asphalt-melting desert heat. Al-Maktoum, who fancies himself the Gulf’s prophet of modernization, likes to impress visitors with clever proverbs and heavy aphorisms. A favourite: ‘Anyone who does not attempt to change the future will stay a captive of the past’. Yet the future that he is building in Dubai—to the applause of billionaires and transnational corporations everywhere—looks like nothing so much as a nightmare of the past: Speer meets Disney on the shores of Araby. Two attitudes to cheap labor: Mike Davis’s and Paul Krugman’s.